We stumbled on Bunny Bonker last night in Google Play, thinking that the game looked to have some good potential. We were totally right on the money. It is a free game, featuring some fantastic 2D art, as well as some addictive music. The gameplay is quite simple to understand, yet extremely challenging to master. You are placed in a world that has become overrun with bunnies, and it is your job to wipe the little guys out. The only way to do that is with your fingers, as you tap tap tap your display until you can’t tap anymore. 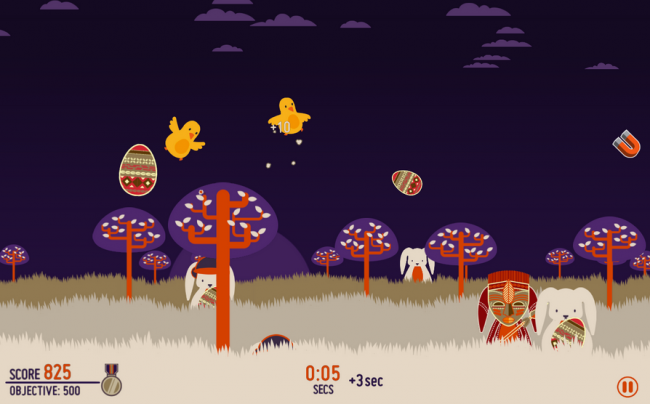 After you tap on bunnies, they start flying around the screen and some bunnies are carrying special items. Your only goal is to keep tapping on everything and rack up as many points as possible before time runs out. It’s a seriously fast-paced and crazy game. Go try it out and let us know what you think down below.